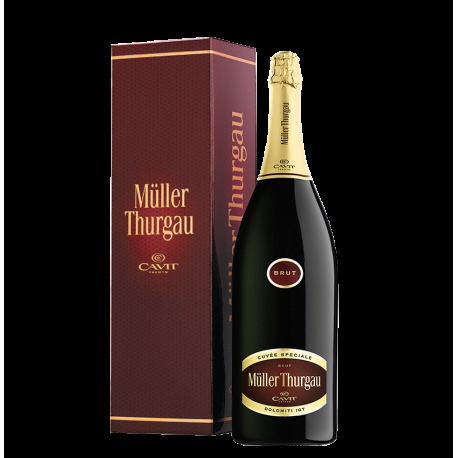 The sparkling Müller Special Cuvée is made with the Méthode Charmat technique, known also as Metodo Martinotti, which is produced through the aging on the yeasts and a second fermentation into big stainless steel vats. This process enhances the subtlety of the varietal aromas. The grapes grown in hilly and mountainous vineyards in the Cembra Valley and Cavedine Valley are carefully selected before being processed. Extremely fine perlage forming a white foam and long-lasting crown; pale straw in colour with marked greenish tinges; delicate, exquisitely aromatic nose with spicy notes. Smooth, pleasantly crisp palate, elegant and full of character. High hillsides or even mountains up to altitudes of 800 meters above the sea level in some areas in Trentino which are particularly suited to the production of white grapes (Cembra Valley, Cavedine Valley, Brentonico Plateau).